Do you have a dish that never fails you, like a loyal friend, who keeps showing up and impresses you by always being top-notch? I have a few and this lentil chilli has been the star of my regular repertoire for years. It actually tastes more like a curry than a chili, but thats besides the point now. This is also one of the most made and loved recipes from my blog. Lentils can come across as a bit dull sometimes, but this dish is nothing like it. 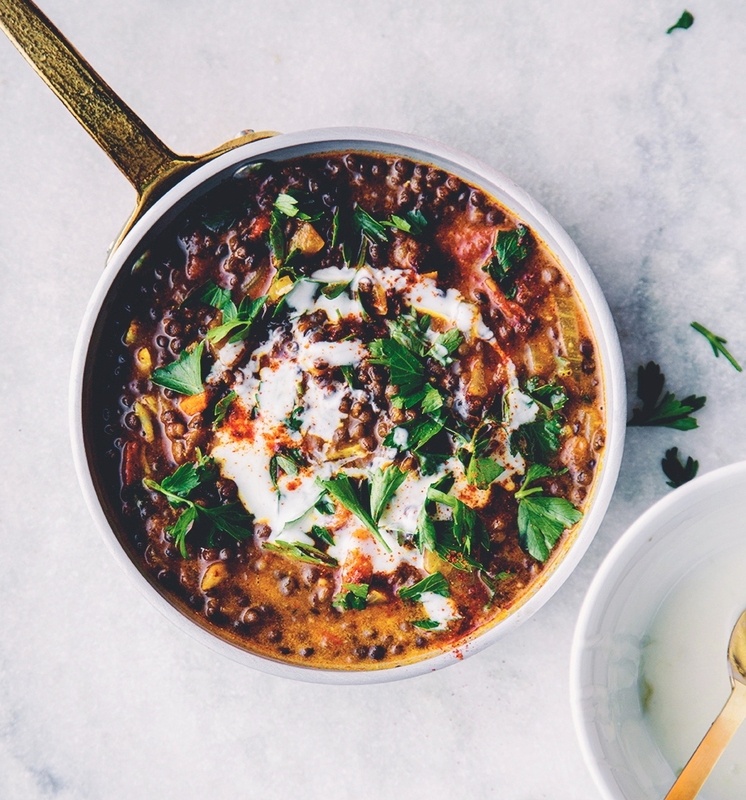 With flavours that really sing together – earthy cumin and cinnamon, tangy lime and coriander, hot chilli and garlic – it harmonises perfectly with sweet butternut squash and chewy lentils. Instead of butternut squash you can use cooked pumpkin, aubergine or any other fleshy vegetable you have. This recipe is an excerpt from my book Bowls of Goodness, you can find it here or in your local bookstore. Pst.., Did you make this lentil chili from the book and love it? You would make me so happy if you wrote a review on amazon, so that more people can discover the book. And I’d love to see your remakes on Instagram, tag me @nourish_atelier in a post and use the hashtags #bowlsofgoodness and #nourishatelier. And without further ado, here’s the recipe for this amazing comfort bowl! Don’t be discouraged by the long list of ingredients, it’s mostly spices that you will already have in your spice rack. Cook the lentils according to the packet instructions, rinse, drain and set aside. Heat a frying pan over a medium–high heat. Add the oil and gently fry the shallots until transparent. Add the garlic, spices, pepper, chilli and tomatoes and fry for a few minutes over a medium–low heat. Stir in the lentils, squash, tahini and honey. Pour in the coconut milk and stir, then let the chilli simmer over a medium–low heat for 5 minutes, adding a little water if needed and stirring regularly. Add the lime juice and soy, then let it simmer for a further few minutes while stirring. Taste and adjust the seasoning with salt and pepper. Remove from the heat. Mix the ingredients for the yogurt sauce. Make the cucumber salad by combining the shaved cucumber and rice vinegar. Drizzle the chilli with extra virgin olive oil, top with freshly chopped coriander and serve with the cool yogurt sauce and salad. Serve with a hot sauce, rice and lime as extras on the table. The recipe is suitable for vegans. Opt for agave and vegan yogurt. Make it gluten free: Opt for tamari sauce instead of soy sauce.